GoodReader update adds signatures - iPhone J.D. The GoodReader app is one of the most frequently used apps on my iPad because it has such great tools for organizing my documents, syncing them to my computers, and annotating PDF files. And perhaps best of all, the developer is constantly finding ways to make the app even better. This week, GoodReader version 4.10 was released, and it adds the ability to create and add signatures to your documents. I've used many other apps with a signature feature, but GoodReader does such a nice job of implementing the feature that it may now be the best way to sign a document on an iPad or iPhone. Being able to sign a document with your iPad or iPhone is very useful. Someone sends you a document that you need to sign, such as a permission slip for school. Rather than print out the document, sign it with a pen, and scan it again, it is so much faster to just sign the PDF file. Of course, you can use just about any PDF app to get a drawing tool and sign your name, but it is much faster to just sign your name once and have the app save your signature so that you can quickly use it in the future without having to manually sign every time. To use the signature feature in GoodReader, just hold your finger or stylus down on (or near) the spot where you want to sign. This brings up a contextual menu with annotation tools which now includes the "Sign" tool at the far end. Tap on Sign. The first time that you use the tool, GoodReader prompts you to create a signature. Use the large white area to sign — preferably with a stylus if you have one, but you can certainly use your finger if you are neat about it. GoodReader gives you the ability to save more than one signature. Just tap the plus sign to create another one, so you can have a full formal signature, a more friendly first name signature, etc. When you are done, tap save. Once your signatures are saved, tapping the Sign tool will invoke a pop-up menu with thumbnail images of each of your signatures. Just tap the one that you want to use, and the signature is inserted. Or if you need to create additional signatures or change the ones that you already have, tap the icon at the far right with a pencil on a box to bring you back to that same screen where you created a signature in the first place. Once you have inserted your signature, you can move it around to place it in the exact right spot. If it is too big or too small, drag the corners to resize the signature. Once the signature is where you like it, you are done. Now you have a signed document. You can now use GoodReader to email the document, save it to your Dropbox or some other location, etc. I recommend that you select "flatten annotations" as you send the document so that your signature becomes a permanent part of the document. GoodReader also lets you modify your signature, just like you can modify other types of annotations. For example, perhaps you used a blue pen when you saved your signature but you want to change this particular signature to black. And perhaps you also want to use a thicker pen stroke, as if you had used a marker instead of a fine tip pen. You can make any of those types of changes just by tapping on your signature and then tapping on the appropriate options in the pop-up menu. Some people are worried about saving their signature in an app because someone else could theoretically use the app with your saved signature and put your signature on documents that you did not intend to sign — such as a child getting access to your iPad and applying a signature to a permission form without asking you. This is not a big concern to me. There are copies of my signature all over the place — for example, on hundreds of pleadings filed in courts throughout the state of Louisiana — so if anyone wanted to get a copy of my signature, scan it, and use it again, they could do so. Nevertheless, it is nice that GoodReader gives you the option to use TouchID with the signature feature, assuming that you are using an iPad (or iPhone) with a fingerprint scanner. With this option turned on, every time you invoke the Sign tool, you are first prompted to put your finger on the home button so that the app can verify that you are truly you before letting you apply a signature. Even though I'm not really concerned about someone using my signature in GoodReader inappropriately, this feature works so well and it is so easy to scan my finger on the home button that I'll probably leave it on anyway. As an added security measure, signatures are stored in the GoodReader app in an encrypted form, are never uploaded anywhere, and are not backed up to a computer or to the cloud when your iPad or iPhone is backed up. I've been taking about using this feature on an iPad, but it also works on the iPhone, and in some ways is even more useful on an iPhone. You can save your signature on your iPhone at a time when you are sitting at a desk and concentrating on creating a neat signature, using either your finger or a stylus. That way, when you are out and about and you want to sign a document quickly, you can do so with just a few taps — first tap where you want to sign and select Sign, then select the signature you want to insert, and then resize and place it in the right spot. Send off the signed document, and you are done. In just a few seconds, you could sign a document while waiting to check out at the grocery store. 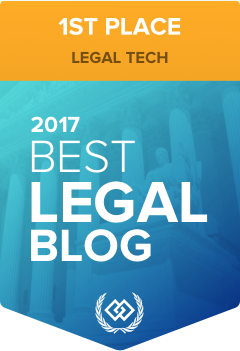 The new signature feature makes GoodReader an even more useful app, and confirms that it is one of the few apps that I consider to be a must-have for most attorneys.